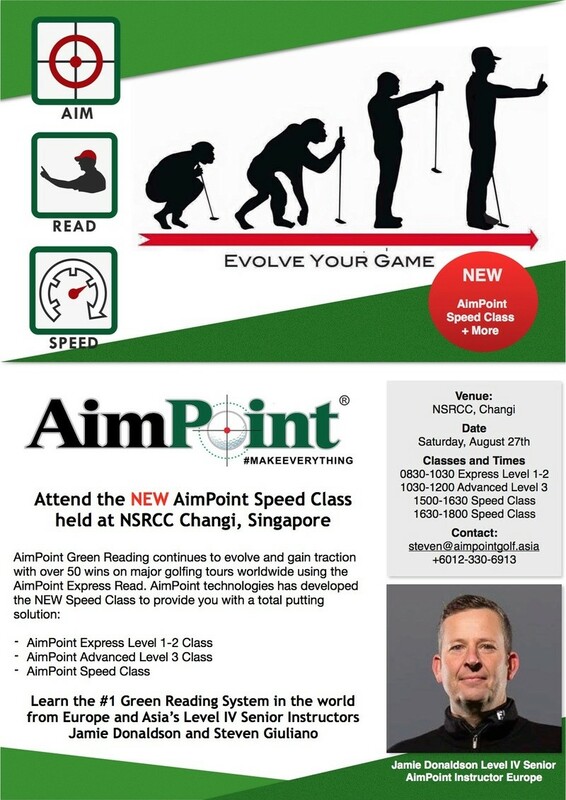 NSRCC Changi is excited to be hosting the latest series of AimPoint Express Green Reading Classes in Singapore on August 27th. Jamie Donaldson Level IV European Senior Instructor and Steven Giuliani Asia's Level IV Senior Instructor will be visiting the region where a series of the NEW AimPoint Speed Class will be delivered. For those who have yet to learn AimPoint Express Level 1-2 Class will also be delivered as well as the AimPoint Advanced Level 3 Green Reading Class which is designed for the serious AimPoint student, key techniques will be taught which have only previously been shown to tour players. It will be a great experience for those who are truly interested in mastering the art of green reading. AimPoint now offers a total putting solution with of 50 professional wins world-wide. Students will have the opportunity to learn some ground breaking techniques currently been used by some of the world leading players including Adam Scott, Lydia Ko, Stacy Lewis and Sergio Garcia. Students will receive class notes with classes limited to 8 students per class, the fee for the Level 1-2 Class is SGD220, the Advanced Level 3 Class and AimPoint Speed Class are SGD160 per student. Thank you to members who have supported the classes in the past and look forward to meeting some of you again in the coming weeks. Just a note to say we have added an extra class this Friday for anyone wants to learn AimPoint Express L1-2 and is unable to make the weekend classes.